Huh. Well, the chiro helped me figure out that I'd turned myself into a human pretzel. Much rehab followed. And I'm still doing it. 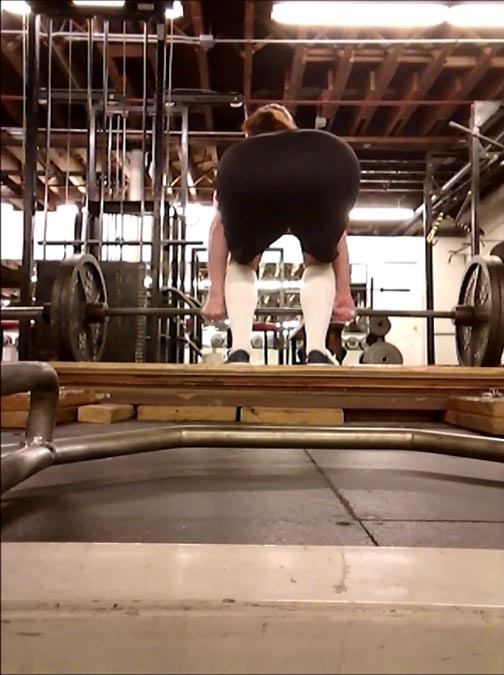 I will say that the top of my deadlift seems to be fixed now, but I've still got some really weird vertical unevenness in my hips coming off the ground. When I finish resolving that, I'm confident I'll have my old deadlift back. Slow process. Nice Bump, and good to see others on track and holding to it. I could not remember if I wrote any goals but I see I did. Although not lofty, I can say this has been a challenge and I am happy to say I have stuck with it. Also, I have been enjoying what is my second goal. (Taking the time to help others). I am helping out a few people , but one that really stands out is a great guy. Almost 100lbs overweight, but strong as hell. 5'9 290 (was 310). He has no self esteem. Wife left him (from what I heard she was very verbally abusive to him for 15+ years of marriage). He has the blessing of an incredible training response. I can see his muscularity. It only has taken him 2 months of training and he benched 405 the other day. He is basing his workouts on some of what I have suggested. Just all basic compound lifts with a small amount of iso work. Long story short I am cutting through the mess of nutrition info this guy has been getting. It is amazing the amount of bad info this guy has gotten. In a world where money did not matter, I would be a trainer and do it free of charge. If I get another email from my gym with something like "Time to detox" ...I am going to strangle someone. To stay on track (despite a lot of stuff that will be taking my time). If I am up for it at the time, finally get in REALLY good shape for the summer. I think I could strike at it this year without having to kill myself to achieve. Side goal: Maintain the perspective to realize I could be more helpful at times. There are some truly good people out there deserving of a push in the right direction. Taking the time to remember that not everyone is a troll. (none here actually!). I have something similar. I am not sure how far it is worth going to "fix" them. The answer is "I dont know". But I do know that my previous injuries left me with some strange imbalances. I think my accident left me with some nerve damage in my leg (all this is just speculation on my part). Long story short I pull to one side on deads as well. I can almost feel the different tensions in my legs. Getting around to "fixing"....I think our bodies adapt to the demands we place upon them. By all means do the best you can to even stuff out, but there may be things you cant fix (like a slight asymmetry in your femur length, or other structural issues...etc). Dont get too hung up on being perfect. Sometimes what we adapt to do is not always "pretty". Think Lamar Gant. 672 dead at 132#bw with a spine that looked like this. Forgot about this thread. I got my 1,400 total in April! My new goal is to not die during the strongman contest I signed up for in August. Honestly, to not get a zero in any of the events is my goal. Not dying is just a bonus. Awesome, Congrats on hitting it so quickly....now for 1500! !